The size of our chemical cleaning product range ensures Mining & Oilsands clients get the right cleaner for any job. Our highly successful BLACK HAWK, along with BIO-NATURAL PLUS, CITRIO, COMBAT and the multi-purpose, heavy-duty, cleaner and degreaser FASTQLEEN, guarantees the highest standards of clean in the toughest machinery. And, whatever your specific environmental needs we have the right cleaner for you. Our products can be found in varied companies, from small machine shops to large plants. Best of all, Velocity Chemicals costs much less than our competitors and provides a consistent product with on-time delivery. BIO-NATURAL PLUS is a powerful solvent degreaser designed to dissolve bitumen, pitch, tar and open gear grease. 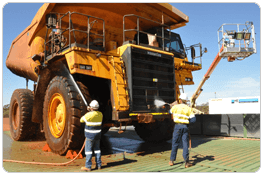 BIO-NATURAL PLUS is used by mining, asphalt, paving and trucking companies to remove bitumen and tar from equipment, machinery, vehicles, heat exchangers, floors and shop areas. BLACK HAWK is a powerful solvent degreaser designed to dissolve bitumen, pitch, tar and open gear grease. BLACK HAWK is used by mining, asphalt, paving and trucking companies to remove bitumen and tar from equipment, machinery, vehicles, heat exchangers, floors and shop areas. CITRIO is a powerful water based citrus cleaner and degreaser. It is used to clean various soils, including bitumen, fuels, greases and oils. Also, CITRIO can be also used to clean any other metal surfaces soiled with fuels or oils where a solvent based cleaner is not desirable. 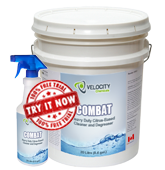 COMBAT is a heavy duty citrus based cleaner and degreaser. It is used to clean various soils, including bitumen, fuels, greases and oils. Also, COMBAT can be also used to clean any other metal surfaces soiled with fuels or oils where a solvent based cleaner is not desirable. FASTQLEEN is an oil splitting multi purpose, heavy duty non caustic cleaner. It is effective for cleaning grease and oil from engine blocks, transmission housings, differentials and internal engine components. It is also an excellent floor cleaner. It cleans exterior surfaces of locomotives, rail cars, trucks and truck frames.